Ibis Barcelona Plaza Glòries 22@ is located in Barcelona’s Glòries district, 500 metres from Torre Agbar. It offers a fitness centre, 24-hour bar and soundproofed rooms with a flat-screen TV. 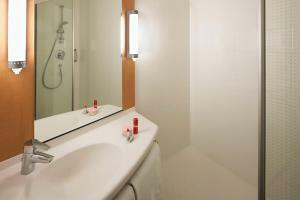 All rooms at the Ibis Plaza Glòries have air conditioning and heating. They also have a private bathroom with a hairdryer. Free Wi-Fi is offered throughout. The Hotel Ibis Plaza Glòries has a restaurant which serves a buffet breakfast, and you can get a drink at any time of day at the hotel’s Diagonal Mar bar. Llacuna and Glòries Metro Stations are within 5 minutes’ walk from the hotel. From here you can reach Plaza Catalunya or Barceloneta Beach in under 10 minutes. This room with air conditioning and heating features a flat-screen TV, and a private bathroom with bath or shower, hairdryer and free toiletries. Please note the maximum occupancy for the room is 3 people. Rate: € 62.00 ... € 89.00; select dates below to get current rates. This room with air conditioning and heating features a flat-screen TV, and a private bathroom with bath or shower, hairdryer and free toiletries. Rate: € 66.00 ... € 89.00; select dates below to get current rates.